While top business schools definitely facilitate attractive placements at top companies, they also actively promote entrepreneurship and do not limit exposure to the corporate environment. While selecting a B-school, students look for attributes such as placement, pedagogy, faculty quality, infrastructure, fees and industry interface. 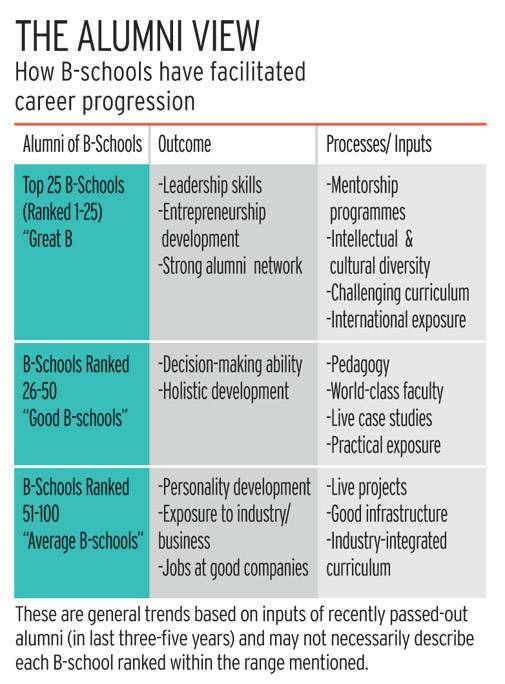 However, alumni look at their alma mater in terms of how it has helped them in career progression. We talked to several successful B-school alumni to understand what differentiates top-ranked schools from others. The responses of these alumni, who feel their career is progressing well, were analysed based on the rank of their alma mater. We then segregated schools' contributions as outcome or process/input. The matrix developed on the basis of this analysis gives some food for thought as to what differentiates "great" B-schools from "good" and "average" B-schools. The alumni see their alma mater according to the way it has shaped their career and, for many, life as well. The great B-schools are viewed not only as institutions of learning and getting good jobs but much more than that. They are seen as helping students develop a strong network for life. Top B-schools not only churn out "employable" candidates but also those who can "generate employment" by their entrepreneurship. They do not limit themselves to teaching "job-skills" but inculcate "life-skills", such as leadership skills, as well. We found from the former students that while average B-schools teach theories and complexities of businesses, marketing, finance, legal aspects, operations, etc, the top B-schools also give training on how to deal with uncertainties of businesses that come not only from the corporate environment but are also the outcome of cultural, global, societal, environmental and technological changes. In terms of processes/inputs that have helped shape their careers, while the alumni of average-ranked B-schools talk about live projects, good infrastructure and industry-integrated curriculum, etc, these are something that top B-schools take for granted. These are part of standard processes at top B-schools and their focus is on intellectual, cultural and global diversity (of students, faculty and recruiters). Beyond standard industry-integrated curriculum, good faculty and pedagogy, they offer opportunities that not only help the students in becoming better business managers but also be prepared for life-long learning through mentorship programmes. The alumni of top business schools emphasised that they do not learn to "manage businesses" but to "run good businesses" that are socially and environmentally sustainable and are responsible. They are not only taught to embrace technologies but be change leaders and create business disruption that does good to the larger society. While top business schools definitely facilitate attractive placements at top companies, they also actively promote entrepreneurship and do not limit exposure to the corporate environment. They also encourage career opportunities with political outfits, non-for-profit organizations and start-ups - all aimed at social and cultural change for a better world of tomorrow. Thinking of social-nirvana and manav-dharma against only corporate-karma, coupled with wisdom from Gita that "change is the only constant", is what is making B-schools transform from good to great.